August 1942. The United States Marine Corps lands in force on the island of Guadalcanal and begins the long, gruelling campaign of 'island-hopping'. Over the next three years they will take the fight against Japanese forces on islands all across the western Pacific, drawing ever closer to the Japanese home islands and victory. The Pacific is HBO's companion series to their acclaimed 2001 series Band of Brothers. 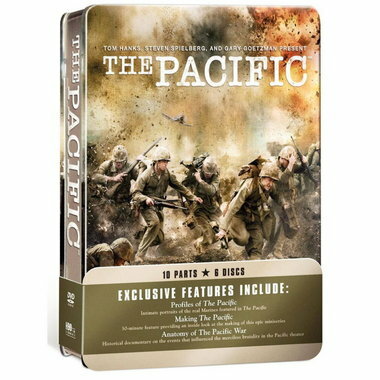 Like the earlier series, The Pacific follows American soldiers across a single theatre of war (albeit a far vaster one). Unlike Band of Brothers, which was able to concentrate on a single company of the 10st Airborne and cover its journey in some detail (the whole series, bar the opening training sequence, only spanned nine months), The Pacific is rather diffuse in its focus. It covers a period of three years and the almost modular nature of the war in the Pacific (multiple major battles raging simultaneously on islands hundreds of miles apart) means it is impossible to focus on one unit throughout the whole war. The series copes with the problem by dividing the narrative into three storylines following three marines (John Basilone, Bob Leckie and Eugene Sledge), but this ultimately proves to be a move with mixed success. Plaudits first. The Pacific is visually stunning. Filmed on location on Australia's Pacific coast, the series employs impressive location filming, practical special effects and CGI enhancements to depict WWII combat on-screen more viscerally and in a more convincing manner even than Band of Brothers. The Pacific really does look and sound like a movie, especially on Blu-Ray, and as an audio/visual experience is always impressive. The lead actors - Joseph Mazzello, James Badge Dale and Jon Seda as Sledge, Leckie and Basilone respectively - are impressive and are lent able support by the likes of William Sadler (as the infamous Colonel 'Chesty' Puller) and Rami Malek, who gives an offbeat but fascinating performance as 'Snafu' Shelton. In terms of direction, production values and acting, the series is overwhelmingly impressive. The issues arise from structural choices for the series. The Pacific War was a very different beast to the Western Front of WWII in Europe, spanning vaster distances and featuring the marines, navy and army fighting simultaneously on different fronts. An immediate drawback of only having ten episodes to tell this story is that other units and services outside the Marine Corps get short shrift. None of the immense naval battles in the theatre (Midway, the Coral Sea etc) are really mentioned and the massive American bombing campaign against Japan is not featured. There are some nods to the other services (the Battle of Savo Island is briefly watched by the marines from the shore; aerial assaults on Japanese positions are occasionally shown) but the focus is squarely on the marines. Even this is problematic. To get across the scale of the conflict, HBO conflates three separate stories together. John Basilone's story allows them to show life on the home front (Basilone was sent home after Guadalcanal, initially serving as a PR representative to raise money for the war and later as a marine instructor before returning to the field during the battle for Iwo Jima), whilst Bob Leckie is used to cover the initial stages of the fighting and also the role of Australia in the conflict. After Leckie is wounded and forced to return home, Eugene Sledge steps up as our principal POV character and we see most of the latter stages of the war through his eyes. This baton-passing approach to the narrative sounds good but ultimately feels disjointed, as the three soldiers' paths never cross (aside a fictitious brief meeting between Sledge and Leckie). It also complicates things by giving us three different sets of supporting characters to also get to know, which is a tall order for just ten episodes. Which isn't to say that what we are left with is still not compelling. The actors do a great job of selling their characters' respective storylines: Leckie is left on the front lines a little too long and begins suffering from battle fatigue; Basilone is tired of being hailed a hero at home whilst his friends are still fighting and is anxious to return to the front; and Sledge is angry at missing out the start of the war due to poor health and is keen to prove himself, only to ultimately start losing perspective as the gruelling months of combat unfold. These are familiar storylines, but are given added depth and weight by being true (all three marines are real, and Leckie and Sledge's memoirs provide the basis for the series). The overwhelming feeling of the series is one of despair. The fighting is savage and without quarter, and the marines often feel that their fighting and dying over specks of land in the middle of nowhere is pointless. There is a lack of any type of grand strategic overview which is true to the experience of the soldiers on the ground. Notably, there is no equivalent to the Why We Fight episode of Band of Brothers (where the 101st liberates a concentration camp and their horrific experiences harden their resolve to help destroy the Nazi regime). The marines are left feeling bereft of a purpose, which makes the horrors they experience strike home even harder. It's no wonder that many of them are shown breaking down or needing urgent time away from the front to reorient themselves. HBO should be congratulated for not downplaying these angles, but it often makes for very hard viewing. The Pacific (****) is ultimately worth watching. It's a stunning production that makes some hard comments about war and its ultimate savagery, even when a war is worth fighting. It doesn't glorify war and shows its horrors in full force, which can make for hard viewing, but the superior acting and writing make it compelling. Structurally the series is disjointed, and would have benefitted from a tighter focus on maybe just one or two of the marines featured. Extending it to three stretches the story almost to breaking point. However, once you adjust to the structural issues the series is an impressive piece of work. It is available now on DVD (UK, USA) and Blu-Ray (UK, USA). Am I the only one who thinks it ironic that any war should be referred to as 'Pacific'? Nice review, and I agree especially with your praise for the special effects (the Battles of Pelielu and Okinawa sequences were fantastic) and with the complexity and disjointness of the three storylines: I had a hard time distinguishing between the secondary characters, so often I had the feeling that my emotive response to some deaths was much less intense than what should've been in the intentions of the authors. Just one note: John Basilone, not Tom. I watched the series only once, but the narrative structure wasn't that compelling, indeed. I had a hard time trying to connect to the supporting cast, but it wasn't that much easier in Band of Brothers with their focus on a different character each episode. Both series' are more ambience pieces, showing the mood and mindset of the era and not so much focusing on characters. Both Leckie and Sledge's memoirs, Helmet for my Pillow and With the Old Breed, are essential reading, especially as a companion piece, as well as being 2 of the finest combat memoirs ever written. George R.R. Martin reads nursery rhymes.